0.9 which equals 31.545 kVA. The transformer capacity to meet this demand will be 37.5 kVA. The next largest standard size transformer is 50 kVA, much too large for this demand load, and the next smaller size is too small. However, if the computed total maximum load was 25.85 kVA times your demand factor, this would give you 23.26 kVA; therefore, you would need a 25 kVA transformer instead of the 37.5 kVA transformer. Your next problem is to determine the most suitable location for the transformer. That does not mean finding the strongest pole but finding the pole that is nearest to the electrical center of the area. The electrical center is the point where a balance is obtained between the total kVA spans to the north and south of the location of the transformer. The kVA span is the product of the number of spans times the kVA load of the pole. To begin with, assume that you are going to place the transformer on pole K (fig. 4-15). Then figure the total kVA spans to the north and south of this location. A chart will simplify your calculation. You can see that if you placed the transformer on pole K, it would be at an imbalanced electrical center; that is, it would be too far away from the heaviest loads. So pick another pole. This time choose pole L and make another chart. Pole L is nearest to the electrical center of the area. That is the pole on which you will mount the trans- former. Single-phase distribution transformers are manufactured with one or two primary bushings. The single-primary-bushing transformers can be used only on grounded wye systems if they are properly connected. 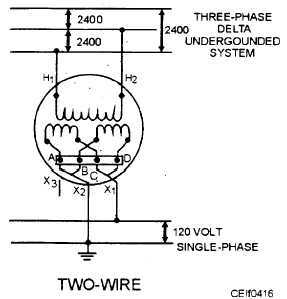 Figure 4-16 schematically shows the connections of a single-phase transformer to a three- phase 2,400-volt three-wire ungrounded delta primary voltage system to obtain l20-volt single-phase two- wire secondary service. The connections for similar systems operating at other primary distribution voltages such as 4,800, 7,200. 13,200, and 34,400 would be identical. Figure 4-16. - Single-phase transformer connection for 120-volt two-wire secondary service. Transformer secondary coils are connected in parallel.